BACKGROUND: Neck pain is a common medical problem resulting from any diseases or biomechanical disturbances. In mechanical/nonspecific neck pain, muscles become tighten, leading to restricted neck mobility. The study purposed to determine the efficacy of Kaltenborn mobilization technique and static stretching in pain and regain of a normal cervical range of motion (ROM) in patients with nonspecific/mechanical neck pain. MATERIALS AND METHODS: Forty-four patients suffering from non specific neck pain were randomly divided into two groups. Group A, in which participants received static stretching (n = 22) and Group B, in which participants received Kaltenborn mobilization technique (n = 22). Pain intensity was measured by numeric rating pain scale and active ROM (AROM) by neck disability index at baseline and poststudy. RESULTS: At baseline, there was no difference in pain intensity and ROM in both groups. At poststudy, a significant improvement was found in both groups in improving ROM and pain. However, no intervention was superior. CONCLUSION: Both the Kaltenborn mobilization technique and static stretching are effective in reducing nonspecific neck pain and increasing cervical AROM. There are different physical therapy interventions such as massage and mobilization but with temporary effects. Kaltenborn techniques used to reduce the pain and improve ROM and reduce pain using sustained traction, compression, and glides in translatory movement. It includes passive movements with less velocity at the limit of joint or in the limit of the joint ROM., Neck strengthening and stretching exercise have also improved neck function shown in addition to reducing pain. Static stretching helps in elongation of pathologically shorten soft tissue structures. it is important for restoring normal muscle length, increase muscle performance and flexibility. No comparative study is available which suggests the superiority of Kaltenborn or static stretching in nonspecific neck pain. 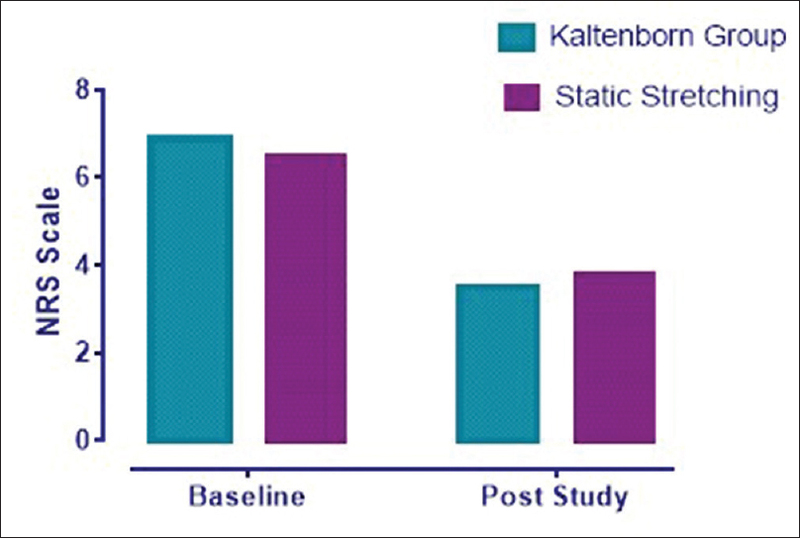 The aim of the study was to evaluate the efficacy of Kaltenborn techniques with a comparison of static stretching in reducing nonspecific neck pain and to increase ROM. The patient was ask to sit on a stool with arms at the side of the body. A static stretch of 60 seconds was applied with four repetitions, and 3 sessions/day for 3 months. Kaltenborn group received Grade 1, Grade 2, and Grade 3 distractions; for pain intermittent, distractions of 7–10 s hold with few seconds of rest interval. And for hypomobility, a minimum of 6 s stretch distraction was performed followed by partial release, and then repeated with intermittent stretches of 3–4 s for several cycles. Paired sample t-test is used to analyze results. Demographic data were represented by bar chart and other factors such as marital status, socioeconomic status, gender, residence, and education are analyzed through descriptive statistics and shown by pie and bar charts. 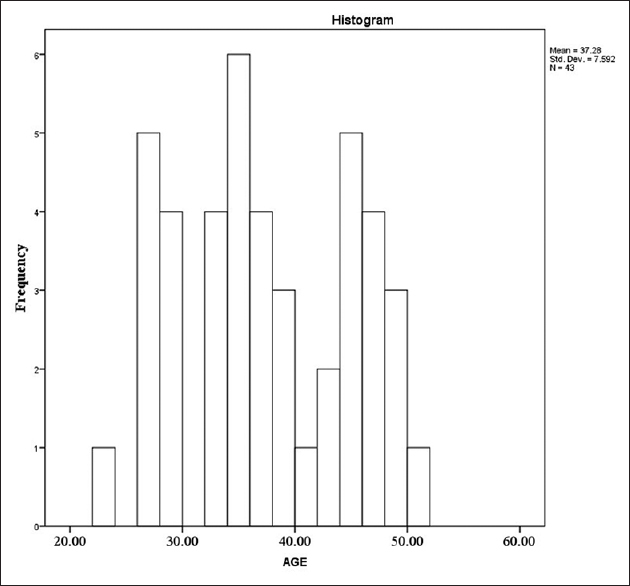 In the study, the mean age of patients was 37 years old, with minimum aged patient 25 and the maximum aged patient was 55 years old [Figure 1]. 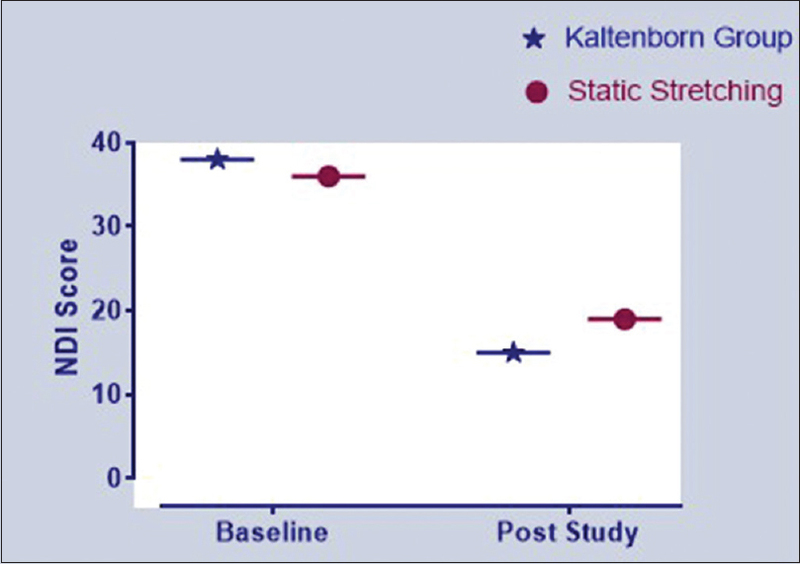 There was no difference in pain intensity at baseline in Kaltenborn and static stretching group. After the treatment period, both groups showed significant improvement in pain intensity [Figure 2]. No difference was observed in neck disability index (NDI) score at baseline in Kaltenborn and static stretching group. After the treatment period, both groups showed significant improvement in the NDI score [Figure 3]. Active flexion and extension of the neck were improved in static stretching by 19.8% and 19.5% and in Kaltenborn group 22% and 23% simultaneously. Similarly, active side bending and rotation ROM were observed in both groups after the treatment period [Figure 4]. The purpose of the current study is to compare the effectiveness of Kaltenborn mobilization and static stretching in patients with nonspecific neck pain. 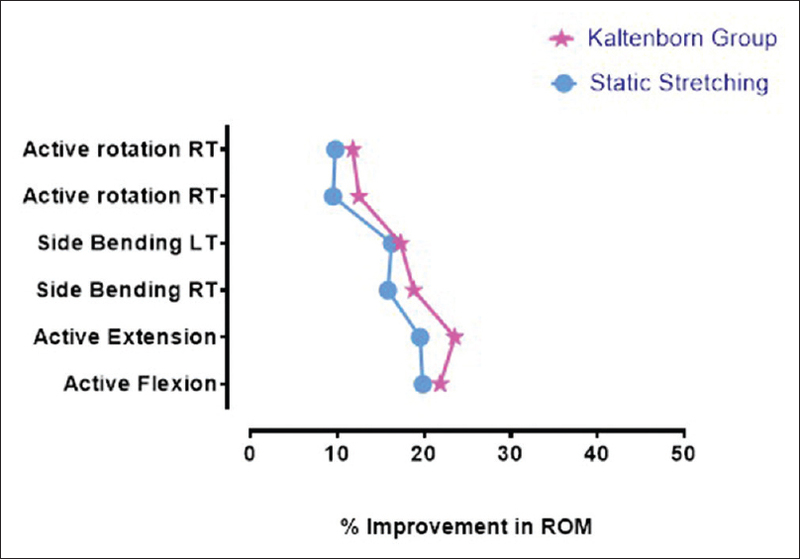 A significant improvement in pain and neck ROM was found in Kaltenborn mobilization and static stretching group. Pain reduction mechanism with mobilization technique can be defined on the basis of different effects occur during treatment. For example, mechanoreceptors are activated through the neurophysiological process to reduce pain, which results in muscle guarding nociceptive activation and affects muscle spasm. The nutrient exchange took place in result of synovial fluid movement because of small gliding movements' distraction on joints. Mechanically, it improves the mobility of joints and maintains extensibility. For the relief of pain, two grades (1 and 2) by Kaltenborn were used. Both grades targeted to stimulate mechanoreceptors (pain relief) and suppress nociceptors of pain. Static stretching pain reduction process based on Golgi tendon organs inhibitory effects which cause decreased muscular tension, relaxation of musculotendinous unit, and affect the neuronal discharge. Soothing effect on muscles, tendons, and reduced pain is the result of these reflexes. Group analysis revealed statistically significant improvement in cervical ROM. Both the Kaltenborn mobilization and static stretching showed greater improvement. Contraction and stretches in combination may be more effective for developing viscoelasticity than only with sustained passive stretching, as more force produced in tissues more will be the viscoelasticity of tissues. Moreover, there is increased extensibility of tissues. The study showed the almost similar result as conducted in previous studies over neck area. There is an immediate increase in ROM of neck after application of Kaltenborn mobilization technique. There were predominant increases of ROM in the treatment group. Passive manual stretches facilitate collagen fibrillogenic process and regain muscle length which decreases the muscle stiffness by improving viscoelasticity or by decreasing reflex excitation of muscles tissues. Static stretching showed significant improvement of ROM inconsistent with a study conducted in other areas of the body, and an improvement in ROM was seen in the shoulder, hip, and knee joint treated with heat therapy combined with static stretching. The possible explanation for the increase in ROM in both groups relies on the effect of autogenic inhibition. Muscular spam and pain can also reduce through moist heat therapy. Posture correction is the most important thing to prevent pain in the neck region. This study concluded that both treatment strategies Kaltenborn mobilization and static stretching applied to patients were effective in reducing pain and increasing the cervical ROM in nonspecific neck pain. de Koning CH, van den Heuvel SP, Staal JB, Smits-Engelsman BC, Hendriks EJ. Clinimetric evaluation of active range of motion measures in patients with non-specific neck pain: A systematic review. Eur Spine J 2008;17:905-21. Kleinrensink GJ, Stoeckart R, Mulder PG, Hoek G, Broek T, Vleeming A, et al. Upper limb tension tests as tools in the diagnosis of nerve and plexus lesions. Anatomical and biomechanical aspects. Clin Biomech (Bristol, Avon) 2000;15:9-14. Kostopoulos D, Nelson AJ Jr., Ingber RS, Larkin RW. Reduction of spontaneous electrical activity and pain perception of trigger points in the upper trapezius muscle through trigger point compression and passive stretching. J Musculoskeletal Pain 2008;16:266-78. Fejer R, Kyvik KO, Hartvigsen J. The prevalence of neck pain in the world population: A systematic critical review of the literature. Eur Spine J 2006;15:834-48. Ballantyne F, Fryer G, McLaughlin P. The effect of muscle energy technique on hamstring extensibility: The mechanism of altered flexibility. J Osteopathic Med 2003;6:59-63. Gupta S, Jaiswal P, Chhabra D. A comparative study between postisometric relaxation and isometric exercises in non-specific neck pain. J Exerc Sci Physiother 2008;4:88. Binder A. The diagnosis and treatment of nonspecific neck pain and whiplash. Eura Medicophys 2007;43:79-89. Christensen JO, Knardahl S. Work and neck pain: A prospective study of psychological, social, and mechanical risk factors. Pain 2010;151:162-73. Fernández-de-Las-Peñas C, Alonso-Blanco C, Cleland JA, Rodríguez-Blanco C, Alburquerque-Sendín F. Changes in pressure pain thresholds over C5-C6 zygapophyseal joint after a cervicothoracic junction manipulation in healthy subjects. J Manipulative Physiol Ther 2008;31:332-7. Cassidy JD, Lopes AA, Yong-Hing K. The immediate effect of manipulation vs. Mobilization on pain and range of motion in the cervical spine: A randomized controlled trial. J Manipulative Physiol Ther 1993;16:279-80. Hoving JL, Koes BW, de Vet HC, van der Windt DA, Assendelft WJ, van Mameren H, et al. Manual therapy, physical therapy, or continued care by a general practitioner for patients with neck pain: a randomized, controlled trial. Ann Internal Med 2002;136:713-22. Holm LW, Carroll LJ, Cassidy JD, Hogg-Johnson S, Côté P, Guzman J, et al. The burden and determinants of neck pain in whiplash-associated disorders after traffic collisions: Results of the bone and joint decade 2000-2010 task force on neck pain and its associated disorders. J Manipulative Physiol Ther 2009;32:S61-9. O'Sullivan SB, Schmitz TJ. Physical Rehabilitation: Assessment and Treatment. Philadelphia, Pa: FA Davis Co; 2000. Mahajan R, Kataria C, Bansal K. Comparative effectiveness of muscle energy technique and static stretching for treatment of subacute mechanical neck pain. Int J Health Rehabil Sci 2012;1:16-24. Miller J, Gross A, D'Sylva J, Burnie SJ, Goldsmith CH, Graham N, et al. Manual therapy and exercise for neck pain: A systematic review. Manual Ther 2010;15:334-54. Ylinen J, Takala EP, Nykänen M, Häkkinen A, Mälkiä E, Pohjolainen T, et al. Active neck muscle training in the treatment of chronic neck pain in women: A randomized controlled trial. JAMA 2003;289:2509-16. Khan M, Soomro RR, Ali SS. The effectiveness of isometric exercises as compared to general exercises in the management of chronic non-specific neck pain. Pak J Pharm Sci 2014;27:1719-22. Chaitow L, Crenshaw K. Muscle Energy Techniques. Leon Chaitow (UK): Elsevier Health Sciences; 2006. Parmar S, Shyam A, Sabnis S, Sancheti P. The effect of isolytic contraction and passive manual stretching on pain and knee range of motion after hip surgery: A prospective, double-blinded, randomized study. Hong Kong Physiother J 2011;29:25-30. Bergqvist U, Wolgast E, Nilsson B, Voss M. Musculoskeletal disorders among visual display terminal workers: Individual, ergonomic, and work organizational factors. Ergonomics 1995;38:763-76.